For the fourth year in a row, Palo Alto Networks has achieved certification from J.D. 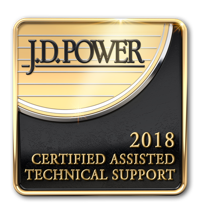 Power Certified Assisted Technical Support Program by meeting certification requirements and even exceeding certification scores. This distinction recognizes Palo Alto Networks for delivering “An Outstanding Customer Service Experience” to customers through the assisted technical support channel over the phone and online. We are very pleased to have met the rigorous quality and performance standards upheld by J.D. Power by exceeding requirements and meeting certification criteria. We are proud of this certification as it distinguishes Palo Alto Networks as delivering excellence across all significant modes of technical support. Secondly, it recognizes that our customer support standards and processes will help customers maximize their technology investments. When our customers see the TSIA Rated Outstanding Assisted Support logo, they can be assured Palo Alto Networks has the people processes and technology in place to provide extraordinary customer support. We are here to help you be secure and give you the confidence you need to keep your business running and protected.